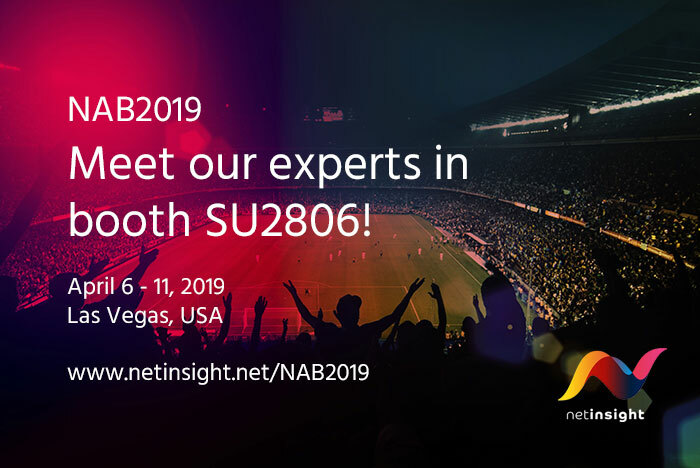 Visit Net Insight at booth SU2806. Request a meeting in advance to secure your time slot! What are the next innovations in live media transport, distribution and resource management that makes things even more cost-efficient and smarter? The industry has been talking about things like SMPTE 2110, HDR, UHD, Ultra-low delay and orchestration for quite some time. So what’s the next big thing? Automation with NMOS? Live production and playout in the cloud? Fully distributed production using SMPTE 2110? Never has the industry seen so many fundamental technology transformations taking place at the same time. The demand for doing more with less is still increasing. These technology shifts have the potential to radically transform the economics of production as well as transport and distribution for the better. Why not book a time to discuss these changes and what to do with them? We’d love to see you at our booth @ NAB! We’ve been invited to speak at 2019 NAB Show’s Broadcast Engineering and Information Technology (BEIT) Conference. Please join us to hear more from our experts. Get the performance and flexibility to meet tomorrow’s media network requirements today. Terabit Media Networks and World Leading Density – Your audience demand 4K, HDR, HFR, mobile, multi-screen, and VR content. For broadcasters and producers, the key to meeting this demand is a shift to new remote and distributed workflows, to cloud resources and to IP based technologies like SMPTE 2110. To make it work – and keep scaling – the combination of capacity and density is everything. As our customer, MTI is saying “Net Insight’s well-proven technology is essential for us and the Nimbra 1060 gives us unsurpassed scalability. It makes us even more competitive in the network services market for media and live sports”. We will demonstrate terabit capacity, new 100G and 25G solutions as well as the world’s highest density for lossless JPEG 2000 compression. Nimbra 1060 is already recognized as the leading solution for media transport by winning two best of show awards 2018. Read more. Nimbra VA received a Technology & Engineering Emmy Award by the National Academy of Television Arts & Sciences (NATAS) for its contribution to the adoption of Internet solutions for live video transport. Do you want to know more? Please click here. At-home and distributed production using SMPTE 2110 – The “At-home production” concept is used for more and more large events, providing better results with fewer resources. And it is now being extended even further into fully distributed production setups over large scale wide area networks. Net Insight has been creating an industry eco-system for even more efficiencies, including the co-developed DirectIP+ solution with Grass Valley as well as Calrec’s RP1 audio transport and cooperation with Riedel to enable highly efficient production workflows for our customers. This growing ecosystem enables continuous improvement of our customer’s workflows and resources and with the Nimbra series a rock-solid solution for any location: From internet contribution at event sites with minimum bandwidth access up to 100Gb/s premium productions. Want to scale your live events and stream to millions of global viewers without losing sync and quality? With Sye you can. Sye is the world’s first live streaming solution that offers a True Live experience on any platform. Sye is already being used to stream to hundreds of thousands of concurrent viewers, every day. Come check out our demo stations at NAB or book a meeting with our team and we’ll show you how the magic happens. And if you can’t wait, find more info here. Check out our infographic to learn more about our scheduling solutions.